Saxophonist Lebron was influenced by his father who played the identical instrument professionally. Later Hugh Lovelady, the lead alto player for Frank Sinatra’s band, was his teacher. He started his solo career with the album Shades (2013) on CutMore Records. His sophomore album New Era was released in 2015 on Trippin ‘N’ Rhythm Records. 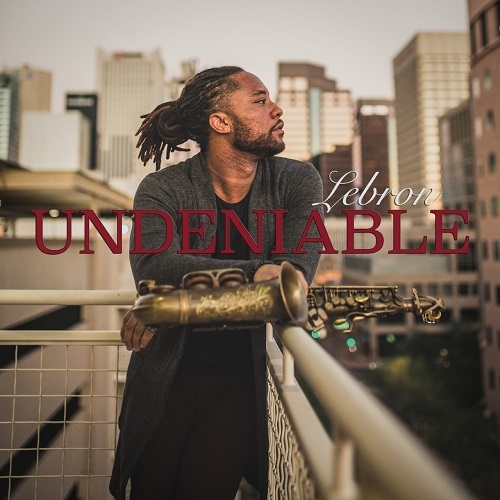 Now he returns with his third project Undeniable (2019) on the same label. Most tunes are written by Michael Broening, who also produced great parts of the album and plays keyboards, piano, drum programming and bass. Some of the tunes are produced by Matt Godina who performs keyboards, bass & drum programming and guitars. Additional musicians on selected tracks are Freddie Fox (rhythm guitars), Mel Brown (bass), Lin Rountree and Cindy Bradley (trumpet), Kendall Lee Gilder (guitar), and Anthony Saunders (vocals). Lebron performs soprano, alto and tenor saxophones. The album starts with the grooving Issa Party that combines the stomping rhythm guitar sound of Freddie Fox with the tight horns of saxophonist Lebron and trumpet player Lin Rountree. On Feels like ’84 Lebron performs in lead position on his alto saxophone adding some horns in overdubbing mode, while Kendall Lee Gilder lets his guitar sing.